These days, all the rage is about building an app. I can’t tell you how many times I’ve heard the phrase: “Hey, I’ve got this great app idea…” Over the past one year, I’ve assisted many startups with building their technology stack. Many of these startups, though, don’t have any in-house technical knowledge. It leads these startups down the path of outsourcing their app development to a different company. And that is where the idea for the Startup Engineering Cookbook for Mobile Apps slide deck came about. I noticed many startups were getting into discussions with outsourcing firms, but had no idea where to begin the conversation or what they were talking about. In essence, the slide deck gives non-technical co-founders a quick technology cheatsheet for mobile app development. It’s a guide to give co-founders the knowledge they need to engage with an outsourcing firm, and understand the various options to them. Many times, co-founders would complain that an outsourcing company insisted the only way to build an app was using xyz technology. When, in fact, there are multiple ways available, but an outsourcing company may only be comfortable with a particular technology. Mobile App Design Process: This is where I find many non-technical co-founders spend their time. This is what they know, and they can literally touch and feel the app interface. It’s usually best to engage with a design firm that can walk you through the paper prototypes all the way to the wireframes and finally the high fidelity assets used to build the app. 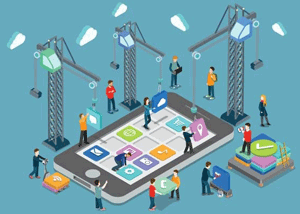 Mobile Architecture: How the app is built is age-old debate. It’s where non-technical co-founders just throw their hands up and say, “I want an app that is available in X months; use whatever!” That single statement has far-reaching implications for the life of the product. If you use a cross platform framework like PhoneGap, you can release your app faster, but you might be limited in the features you can offer, as opposed to taking the time to build a native app. Backend Architecture: If you want to see a non-technical founder’s eyes glaze over, ask them if they prefer to use a LAMP, LEMP or MEAN technology stack. This part of the presentation has many slides, as there are different components to build the backend infrastructure. There’s a new breed of infrastructure services called Mobile Backend as a Service (MBaaS). These companies take the pain away of having to deal with all the complexities of building your own infrastructure from scratch. However, they’re limited in what they offer. You might end up having only some of your technology services on an MBaaS platform. The above article was syndicated on YourStory.com.